Tata steel is attractive at 455 470 level keeping sl at 454 for 1 years target 580 690 closed at 473.40.
gud morning RSI 93.65 mfi 95.95 convergence of macd signal lines and histogram all are sufficient to discourage bulls but so called bulls are showing power when ever they are getting chance ..is ot bull trap which is planned by bears ??? or bulls are really empowered and will keep NF above 8450 for ever ..8500 was predicted target and yesterday kissed 8470 almost will nifty f touch 8500 and or touch yesterdays high and then selling will be there have to wait and watch with micro charts during market hours . http://prntscr.com/57ug9r so plan sell at 8470 or any where below sl keep sl at 8481 tgts 8452 8433 and buy above 8482 with sl at 8468 tgt 8498 8523 . NF may turn its direction from any level plus minus 0.1 % so take care of your trades while booking profits moving sl to trailing sl and to reverse your trade ..
.sell tatamotors futures on rise . so continue on call …. sell on rise target we are lowering to 460 and below ..
Trade with stop loss order …stop loss triggering is not the end of game but you may consider it as the beginning of game or you can assume it as fuse wire which has burnt to protect your house wiring from mega hazard. bang on tgt gained 27 points trdaed at 8372 call was 11 Nov 14, 09:22 AM [×] [o] admin:SELL nf at 8395 sl above 8427 tgt 8373 …kaisi thi Dhanvarsha ?? Learn and earn at Dhanvarsha- Join Dhanvarsha distant learning trading and technical analysis course . Sell Nifty Futures on rise and book gains at low till nifty is trading below 8425 keeping sl at and above 8427 .
please note if any trade moves at Rs 1000/- gain where invested capital is less than Rs 25000/- …either book gains or move your stoploss to cost plus brokerage without any delay. Range trade or range break ?? 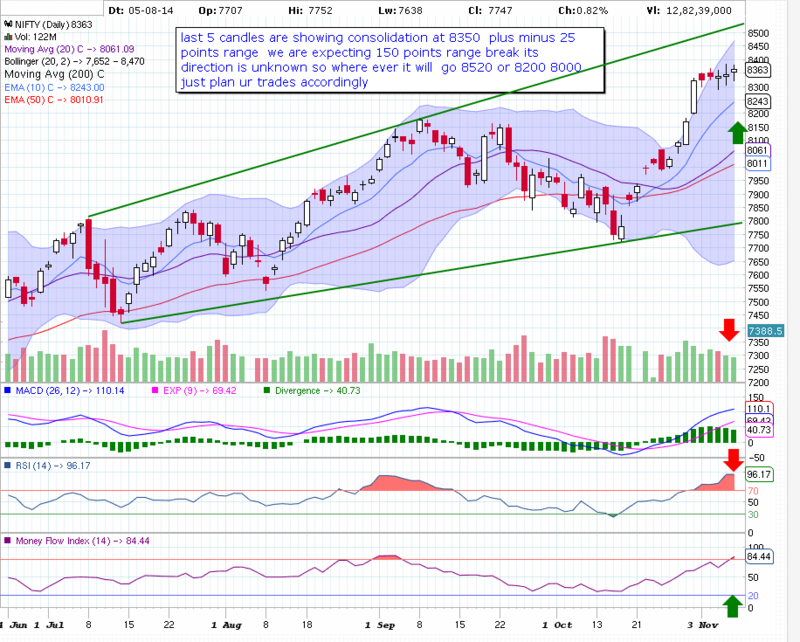 if 487 will failed to support the falling may fall to 459 .. Duration 30 to 60 days . Tata motors 520 pe buy on dips for tgts 20 30 and 40 closed at 10.10 exit from trade if tata motors f trade and sustains above 545 . JPassociat moved up by 24% or more within 1 month of buy advise call was accumulate jp …shared on 28 Sept 2014 at Dhanvarsha http://dhanvarsha.in/accumulate-jpassociat-24-27-range/ ye dil mange more http://prntscr.com/51utg5 abhi 23 month aur baki hain.